May 7, 2013 /1 Comment/in Laser Nail Treatment, Toenail Fungus, Toenail Fungus Treatments /by Jenn F.
Women react differently to being pregnant. Some women, like Megan Fox, frolic at the beach, without a care in the world. Others may feel a little less comfortable with their new look, or even depressed. Either way, the last thing women want to worry about at this magical time in life is… unsightly toenail fungus! Ick! As you know, growing a delicate fetus takes a lot of careful planning. You can’t just take any old medication while you’re pregnant. In this article, we’ll discuss safe ways to get rid of toenail fungus during your pregnancy. When To Eliminate Nail Fungus – Before or After Pregnancy? The decision of when to treat fungal nails depends on your tolerance level. There are safe ways to tackle fungus while pregnant. Following a pregnancy, many women find a renewed sense of enthusiasm to eliminate nail fungus post-partum. Once you’re burning 500 to 800 calories breastfeeding and packing your meals full of healthy nutrients, you’ll find the weight is coming off quickly and you’re looking good. This can be a great time to seek toenail fungus help. That being said, treatment can’t always wait. Is Lamisil For Toenail Fungus Safe During Pregnancy? One woman in the HealthBoards.com forum said she had to stop her Lamisil treatment once she learned she was pregnant. People taking Lamisil generally need to have their livers periodically checked during treatment to ensure there are no complications. Other side effects include: diarrhea, headache, rashes, and changes in taste. While there are no health studies proving that terbinafine causes harm to a fetus, research does indicate that this medication gets passed through breast milk, and is therefore not recommended. The woman was stressed about being a bridesmaid (wearing open toe shoes) in the coming months. The trouble with oral medication is that it doesn’t always work — especially if your shoes are still teeming with bacteria. Your best bet is to save up for fungal nail laser treatment and invest in a SteriShoe® UV shoe sanitizer to limit your contact with bacteria that congregates in the shoes. What About OTC Medications and Home Remedies? You can certainly waste your time and money on topical treatments that claim to be “safe for pregnant women” and old wives’ tale treatments like Vicks or Listerine if you want. However, “each of these remedies is a long tedious process that works less than half the time,” warns Dr. John Sigle writes in a guest column for The State Journal Register. 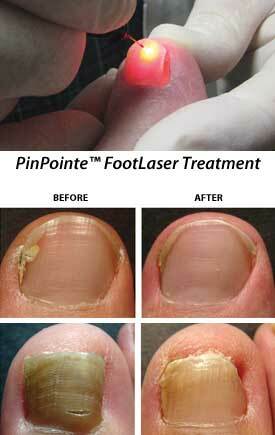 Are PinPointe Foot Laser Treatments Safe For Pregnant Women? “There are no age or health restrictions or limitations – even pregnant women can undergo laser treatment,” according to the Central Carolina Foot & Ankle Associates. During the procedure, there is no numbing or anesthesia needed. You may feel slight warmth where the laser is penetrating the nail. It’s a simple walk-in procedure that is over in less than an hour. I hated that I had nail fungus it was disgusting and I lost my toenail. But this helped me! Diagnosing Diabetic Foot Infections: What You Can Expect Is Stress Causing My Smelly Feet?